Entering the ring standing 14 inches 14 pounds it’s HAAANNNNK! I’m a Dachshund/Chihuahua mix and I’m at the top of my game. I’m a real athlete and dare I say over achiever? During my 4 years in this ring they call the world I try to maintain a healthy regimen of exercise and diet. 15 reps of playtime a day. I love making new friends to workout with so I’m great with other dogs annnnd kids!! Workouts are followed by cool down cuddle sessions with my coach (you) on the couch. Treats, treats ,treats, does a body good. I’m a real man of discipline and just the guy you have been looking for! There’s an adoption fee of $220. So Tag me in! And we’d make the ultimate tag team. I’ve got all my vaccines, microchipped and neutered. I’m getting fit for YOU! I’m looking for a new workout buddy and I’d love for you to be my new life coach. 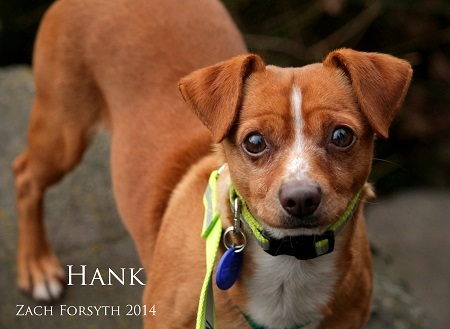 My name is Hank the Tank and I’m the ultimate contender for you lap and heart! To meet me fill out an application at pixieproject.org.